A few minutes after 11pm on the night of Wednesday 19th September 1906 a London to Edinburgh sleeping car and mail train, which had been due to stop at Grantham, ran at speed through the station against the signals. At Grantham North signal box the points were set towards the Nottingham line because, shortly before the express was due to arrive, a goods train from Leicester had passed across the junction. Consequently the Scotch express took the diverging line at Grantham North well in excess of the safe speed. The ensuing high speed derailment on the bridge and embankment beyond the signal box, and fires which subsequently broke out in the wrecked wooden coaches, took 14 lives including those of the locomotive crew. Much has been written about the accident and its likely causes. Tracks through Grantham can add little to existing published accounts, so we refer interested readers to the 'further reading' listed below. However, with the exception of the unfortunate driver and fireman, the stories of the people who died that night have not been revisited. The passengers that fate brought together on the train were 'a mixed bunch', and we are discovering some remarkable untold stories. Some have left reminders which can still be traced today - if you know where to look. Follow the links in the list of the casualties below. 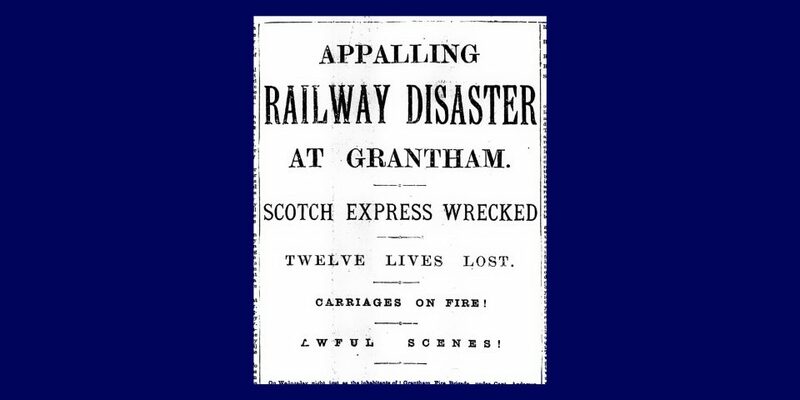 There is more about the accident in our page people and incidents in the history of Grantham North signal box. Great Northern News (GNN) No.149 (Sept/Oct 2006) pages 149.11 to 149.23, The Grantham Accident, 19th September 1906 [originally published in 1982, revised and illustrated]; supporting information and correspondence in GNN Nos. 150, 151, 152 & 153. Published by The Great Northern Railway Society . Peggy Robertson died 10th November 1906 from injuries received and shock sustained at the same time. Daughter of Sgt. John Robertson. Thank you for the information about Peggy Robinson. I have now added her name to the list of casualties. It's very interesting to hear from a descendant of one of the victims of that tragic accident which took place so many years ago. We have some press reports of the time which mention James Miller and I'm sending them to you by separate email. You are right that only one of the people who were killed was reported as being buried in Grantham - a Mrs Baguley.